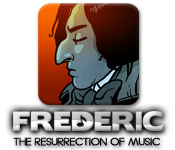 Frederic: Resurrection of Music is rated 3.5 out of 5 by 15. Rated 5 out of 5 by blulapis from Really fun, piano hero for the PC Kudos to the developers on this one! This is creative and different from any other casual game I've played. You play along with music from Chopin, but the developers have adapted the music to different styles. So, for example, you duel "Rob Marley" in a laid-back Carribean version of a Chopin piece. Duels consist of hitting notes correctly. 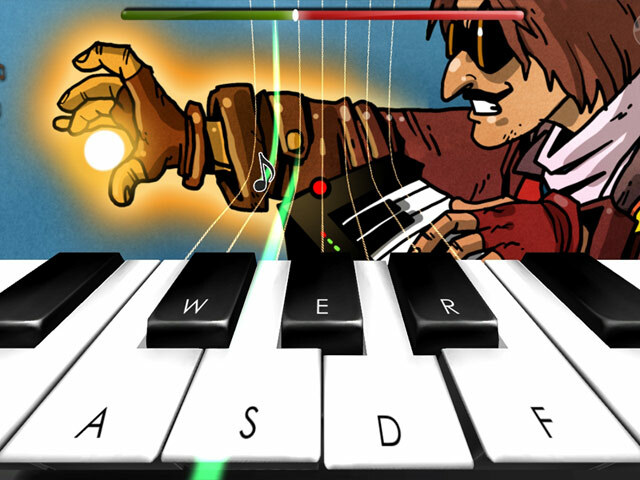 You can use the mouse or pick which letters on the keyboard you want to be your 'piano'. There is a gradation of challenge, so you can pick how hard you want it to be. The music they selected is lovely and catchy. Makes me want to listen to the original Chopin. The comic book story didn't appeal to me, but you can skip it to get to the musical game. It may appeal to others, though, who may like bright cartoony graphics. If you don't like music, you won't like this, but if you do, I recommend this as an addictive game that has you going back to play along with music by Chopin over and over again. Rated 5 out of 5 by schubert2 from Absolutely Awesome!!!! I love classical music and adore Chopin. This is an extremely clever and well thought out game. I thought it was ingenious the way the developers choose the pieces where the melody is played within the 7 notes (f through b). I enjoy playing the piano and I found myself going back to replay these pieces on the piano. The story line had me laughing out loud many times and the play sytem, awkward and challenging at first, actually worked quite well after a bit of practice. I am really looking forward to going back and play at the higher challenge levels. And, yes, thank god, the space bar does allow you to skip the cut scenes and go directly to the duels (it would have been nice for the developers to tell you this on their help page). And, speaking to the developers, what about "Beethoven: Resurection of music"? He's tired of just de-composing. Rated 5 out of 5 by muzicgal from Different, but Fun I have enjoyed my first encounter with this game. As a musician myself, i must admit it was harder than I thought it would be. I dived right into the game without reading the help section...should have done that first. I replayed the first song and did much better the second time around. I am playing on too easy and using the mouse. The one thing that I object to about the game is having to rehear the entire dialogue between Chopin and the challenger...at least, I couldn't find a way to skip it. If anyone finds a way to begin the challenges without the dialogue repeat, please post it. Rated 5 out of 5 by indigo_ladybug from craziest funkiest game EVER! So I looked at the other reviews, and was saddened that this was for Mac. thankfully, I looked at the requirements - WINDOWS SCORE! WOOHOO! ahem. So, you play the resurected Chopin, and you "battle" opponents by playing music against them. The demo only has the first 2 #of apparently 10# songs. There are various settings, I played on too easy #and failed!# and the input is either mouse or keyboard #haven't tried mouse yet - trying to untangle my fingers#. This game is unlike ANYthing I've EVER played. Its weird. Its different, its... AWESOME! Quick tip, READ THE HELP and it will explain how to play, when to hit the notes, etc. The story line is cute, the cartoony figures are meh., but I could not resist a re-duel, which you can do. I play piano by the ear #I stop when the headaches get too bad#, so this is different. Try it. you'll either like it, love it, or hate it. ^_^ but TRY it. Oh, and even if you fail, you can still move on to the next dude or dudette. If you're a perfectionist, play time ^_^ I would recommend this game BUT with only 10 levels #I know I know replay, get better# not sure it would be worth a credit. Then again... the ingeniousness and funkiness of this game, plus the sound quality, well, may well make it worth a credit. you decide. I'm gonna go duel some more. Rated 4 out of 5 by toothrooter from Fun...Different...Exciting This is a fun, different and exciting game! The trial was way too short. I'll probably buy this game and when I finish I'll review it again. Btw, to skip the movies, hit the space bar. I give it a 4-star just 'cause I almost never give a 5. Rated 4 out of 5 by RyeMcLaughlin from Piano Hero Guitar Hero for piano. This is based on a fairly short play time, so I don't know if it would get boring after a while. Lots of technical options, screen resolution, graphics quality, and input. Looks like you can play it with a game control, mouse(not the default) arrow keys or letters on the keyboard( you can choose which keys). To choose which keys to use, select Input Options on the main menu (not the popup Graphics/Input window). Click on a piano key shown with the cursor, then choose the key on your keyboard. That way you can play with both hands. There are four difficulty levels, Too Easy, Normal, Hard and Chopin. The muses have raised Frederic Chopin from the dead to battle against a modern day one man electronic band. Why? They don't say. This opening cut scene is fairly long - there is a total of one hour of cut scenes. There are no instructions, apparently they assume you know what to do. There are 7 wires leading to your keyboard. Notes appear and you have to wait until they touch the key before you click on that key. I played on Too Easy mode and was hopeless, but hopefully that's because it took me a while to figure out how to play. Looks like it would be lots of fun for kids. It's nice to see something completely different. I recommend this with reservations that you give it the full demo time. Rated 4 out of 5 by megwoman25 from UM...Strange but Fun? I don't know how to review this game and since its only out for mac users and there is no forum to review it, I'll just do a brief one here. BTW, why don't mac users get a forum when games are released for us only? ANYWAYS This is probably one of the weirdest, most bizarre but strangely fun games I've ever demo'ed. You play as Frederic Chopin who was a famous musician (piano to be exact) and you are playing a bunch of his classics in a battle type atmosphere against other musicians except their names are changed like I just played against what looked like Bob Marley but his name was Rob. Anyways, you play a piano battle against your opponent and best job wins. Its almost like a role playing game like a battle scene except instead of magical powers you can take your opponent out with musical notes. This is a large file game and so far I can't figure out why. Maybe its the music files within it? It has cartoon graphics and it does have an amusing story line like when I ran against "Rob", he passed me something that RELAXED me so I could play the piano and not be nervous. The thing about this game is, I actually really like the overall premise and Im a huge music fan so it intrigues me but I think the controls are very confusing and hard to manage. Im playing on "too easy" mode and if this mode is too easy, I don't want to see normal or difficult or I think very difficult? It had a lot of choices. It fit my widescreen and gave me a choice of what kind of graphics I wanted which was like 7 types but I chose beautiful and it was cartoony so it wasn't what Id consider beautiful but maybe compared to the rest? I didn't check. 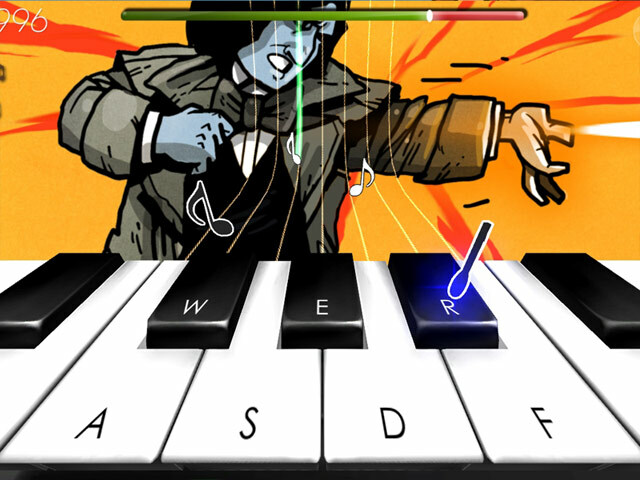 So the controls are either the mouse or the keyboard using buttons WER ASDF (WER are the black keys and ASDF are the white keys of the piano, its been a LONG time since I played the piano so I don't know the actual notes, sorry but this game doesn't give them to you anyways). So in order to play the piece, it zooms the notes over this makeshift keyboard and you have to push the buttons at the right time OR you can use the mouse to push the keys. I tried it both ways and Im better with the mouse but its still hard and like I said I was on the "too easy" level. It was hard at first to do the song but the songs are kind of long so halfway through Id finally be pushing the right buttons. The animations and characters in this game are so funny that it makes the game for me. I can't say Id buy it unless it was on sale BUT it amused me enough to keep playing. Also, it scores you on accuracy and mine was awful, like one time I scored 29% but the game still let me progress to the next musician so at least you can progress even if you stink. Id say try it out because if you like music and can get used to the controls, Id say it would be a pretty fun game. Cheers. 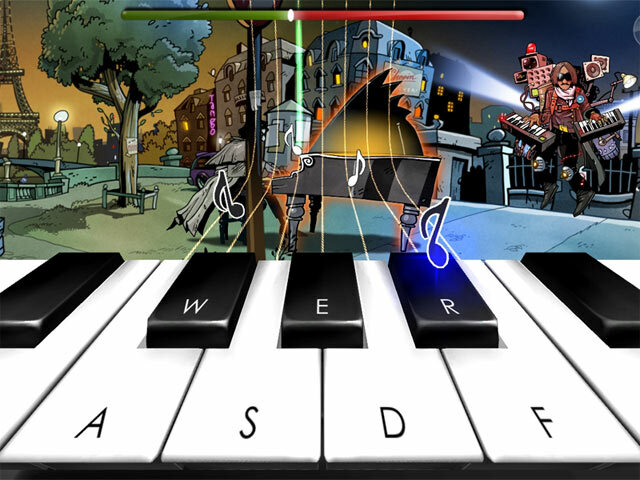 Rated 3 out of 5 by Riven_Raicha from I'll Stick to my Air Guitar While I was very intrigued by the premise of this game (a classical themed Guitar Hero typing tutor with a slight sprinkling of zombie), I was thrown by the very first level of the adventure mode. If given the option on a game, I start on the easiest possible level to see how well the game mechanics handle at the most basic level (a.k.a. it is easier to distinguish between technical troubles and chair-to-keyboard interface troubles). After the opening cut scenes-demonstrating a strange need for animation when the art style of thick, messy hand drawn lines don't lend well to it-we head into the first musical battle against what can be summed up as a blonde man propped up on discarded 80's electronika equipment who seems miffed about you copying his nose job. Then came the actual game play. The keyboard in the foreground was clean and neatly labeled and popped nicely against the background's fidgety graffiti. The notes would come down one of 7 little strings which attached to one of the 7 keys on the keyboard, and you were to press the appropriate key as it slipped over the key and off the keyboard and, presumably, into your lap. There were 2 immediate troubles for me: 1. The strings were all white and curved in towards the keyboard. The odd shift in perspective and the similarities in the string made it difficult to tell which notes are going to what key. This is made doubly difficult with having black keys (thus putting 2 keys very close together) and the background wandering hither, thither and yon. 2. Rather than a slow, but steady, stream of notes hitting you on the first stage, you get a sparse collection of notes followed by an apparent tempo change and a veritable brief landslide of them. This felt like a third or even fourth stage on the "very easy" setting- not the first one.Even if the aforementioned perception shift was added for increased difficulty, the flow of the very first level gives you little time to get accustomed to that challenge-it just makes you stand up in a mini rage and spill all your notes in your lap all over the floor. If the strings were straight and the level more balanced, then this would be a far more enjoyable game, strange animations aside. However, I acknowledge that I do not play rhythm games normally, so if it is something you are well accustomed to and feel that I might perchance be a ninny, then it is worth a look. Even more so for not being the hyperballillionth horror Hidden Object game.